The girl just can't help herself-- Hillary Clinton used her famous cackle on Thursday to deflect a question about the $800,000 her husband earned in 2005 giving speeches for a Bogota-based group that supports the Colombia free trade agreement â the same trade deal she currently opposes. ...there was a mythical black president who held court with his white wife. They lorded over the land, until he was impeached and she bolted for the world's greatest deliberative body. Today, the mythical first black president is trying to help his white wife beat a man who could be the actual first black president. The white wife launched the first racial salvo, when she suggested that all Martin Luther King, Jr. did for civil rights was to "make speeches." To reinforce the point, she said, "It took a president (Lyndon Johnson) to get it done." Meaning: it was swell that King made some speeches and stuff, but it took the white guy in power to make it happen. The mythical first black president then disrupted his welcome in Black Presidentville with a cranky tantrum: the campaign of the actual black man in the race was "the biggest fairy tale" he'd ever seen. And he's seen a lot of them, so there. Blacks around the country took offense that their mythical leader would dismiss the actual black candidate as a fantasy, so the mythical black president took to the airwaves to try to clarify: he meant that the black candidate's position on Iraq was a "fairy tale," not his candidacy. Black audiences weren't buying what the mythical black president was selling this time. Meanwhile, the white wife claimed that while the black candidate was an "inspirational speaker" (shorthand for a great preacher), he hadn't "put in the spade work to be president." The Rev. Al Sharpton must be too busy admiring his "Destroying Don Imus Award" to notice. On Sunday's "Meet the Press," the white wife claimed that this campaign shouldn't be "about race." Which is why she didn't mention race, right? New polls show that black voters support the actual black candidate by a 50 point margin over the white wife of the mythical black president. Among white voters, the white wife has a much more vulnerable 14 point lead. Black voters in South Carolina and beyond might say to the New Hampshire women who carried her over the finish line, "We're glad you're proud to have a woman in the race. But we've got a black man in the race, and we're proud of him, too." The pendulum, in other words, is about to shift again. Race was irrelevant before the mythical black president and his white wife injected it into this campaign. Nobody much cared about the color of the black candidate's skin. They just cared that he was smart and dynamic and talented and they worried that he may not have had enough experience. But the white wife's campaign was seeing these polls before any of us did. She knew that she'd have to make it about race to scare up racial fears and get her base---white voters---to the polls. It's the dirtiest of dirty tricks. Here's another rich but sad irony: the mythical first black president and his white wife claim to embrace minorities, to work for their advancement, to help them achieve equality, and to work toward racial unity. And yet here they are, stoking the flames of racism, dismissing a black man of undeniable ability as a "fairy tale," and dividing by race. For two people who claim to admire Dr. King, the mythical black president and his white wife have turned his most powerful adage upside down: they are asking us to judge the black candidate by the color of his skin, NOT by the content of his character. Then again, would you expect anything different from two people whose own characters are empty and malignant? Either the Clinton War Machine is more inept than anyone thought, or Senator Barack Obama's background really is that clean. The New York Times's political blog CLICK HERE is reporting today that Senator Hillary Clinton's campaign is still---at this late hour---trying to dredge up dirt on her chief opponent. Why haven't they done this already? And if they have, they clearly came up with nothing, because as of yesterday, they were still trying. SECOND ARE YOU PEERSONALLYAWARE OF TH EWORK BARACK DID ON THE SOUTH SIDE WITH COMMUNITY ORGANIZATION S , ETC ./. BOB WHAT DI DHE DO AFORE HOW LONG AND WITH WHO ?? If they don't have the dirt by now, it doesn't exist. They've got nothing on Obama, and they're losing ground to him faster than than you can say "Oprah." By the way, did you notice that Hillary's campaign is still referring to itself as an "Exploratory" Committee? I guess that's so if she loses to Obama, she can always say, "I wasn't really running for president. I was just exploring it." At a campaign stop in Iowa yesterday, New York's Junior Senator simultaneously gave off the whiff of desperation AND played the old victim card. Referring to what she has called her Democratic opponents' "piling on," Hillary Clinton lowered the boom: "I have said for months that I would much rather be attacking Republicans and attacking the problems of our country, because ultimately that's what I want to do as president, but I have been for months on the receiving end of consistent attacks." Dramatic pause, and then: "Now the fun part starts." The "fun" part is, of course the specialty of the Clinton Strike Force: against opponents, fire away with overwhelming criticism, fear and intimidation tactics, opposition research offloaded bit by bit, whispering campaigns, and denials, obfuscation, and stonewalling. She can't wait! Queen Bee expected a coronation; ergo, her comments that she would have much rather spent her time attacking Republicans. But, woe is her. Girlfriend has some Democratic opponents who failed to yield to the Clinton Ladies Intervention Team, and now she's got to spend her time and resources trying to kneecap them. She is exasperated. She may as well have said, "I hope you're happy!" So now she's out with the "victim" routine again. But look out! While she plays the damsel tied to the railroad tracks, her team is out there with machetes. Slashing and burning. After all, to them, it's "fun." Last night, as I watched the Republican presidential debate on CNN, I made notes in between rolling my eyes at how stultifyingly boring it all was. But then, toward the end, something caught my ear. A man stood up and asked a question about gays in the military. Fair enough. Until he went on the say that he had served in the Army, rose to the rank of Brigadier General, and had stayed closeted as a gay man until he retired from the military. I made the following note at that very moment (I swear this is the verbatim thing I wrote): "Close to the end, we had the gay General, who said he came out as a gay man after he left the Army, and he said he thought gays should be able to serve openly. "Guess who's position THAT is?! HRC. "The gay General a Hillary plant? Up to you!" Even as the General was still speaking, I knew he must have been placed there either on the orders of Hillary Clinton's campaign or on his own accord, but certainly with the idea of helping her in mind. Turns out, he was named co-chairman of Hillary's National Military Veteran's group THIS MONTH. All of the criticism this morning seems to be leveled at CNN, and that criticism is justified. They ran the previous Democratic debate like discount night at a brothel. Last night's spectacle was almost as bad. But the real criticism should be directed to the Junior Senator from New York, whose campaign is getting away with murder out there. Peppering the audiences with her supporters (who last night booed everyone EXCEPT the only guy she can beat: Huckabee), planting questions, denying knowledge, stonewalling to the death. These are classic Clintonian tactics. She should be called out on them rather than have CNN take all of the slings and arrows. CNN was at fault, but the Clinton Ladies Intervention Team also played CNN----and us----like a Stradivarius. Workers at CBS News have voted to authorize a strike, which means that the CBS News-sponsored Democratic debate, scheduled for December 10, may be postponed or cancelled altogether. I know. A sad day in America. "I will honor the picket line if the workers at CBS News decide to strike. "America's unions are the backbone of America's middle class and I will always stand with America's working men and women in the fight to ensure that they are able to earn a fair wage." Girlfriend's fist is firmly in the air. Hillary Clinton would walk over her grandmother if she thought that would help her get re-elected to the presidency. She would cross picket lines and trample striking workers if that would advance Hillary somehow. The fact that she says she won't cross the picket lines to attend the debate means only one thing: SHE KNOWS THESE DEBATES ARE HURTING HER. SHE KNOWS THAT EVERY TIME SHE APPEARS IN ONE, HER POLL NUMBERS DROP. ERGO, SHE WILL AVOID ALL FUTURE DEBATES. The CBS strike comes at a fortuitous time for the Junior Senator. Who knew that in addition to bringing home the bacon and frying it up in a pan, she could also channel Lech Walesa? Howard Wolfson, Clinton's campaign communications director, said she has "no idea" what the item is about. (Of course not!) In a totally transparent example of pure projection, Wolfson added: "This is how Republicans work." Actually, this is how the Clinton Ladies Intervention Team works. Just ask the Governor of New York. Do you know what it costs to dryclean an asbestos pantsuit?! At an early point during last night's Democratic presidential debate, former Senator John Edwards dared to challenge Senator Hillary Clinton on a range of issues. She waited for a beat or two, and then----with a steely look----admonished him for "mud-throwing." Poor Edwards cowered in the corner for the rest of the night. Because you are not allowed to challenge New York's Junior Senator, her rivals and the press back off, let her have her zone of delicate flower womanhood, while she rolls over all of them. If anybody raises questions about her positions or the fact that she's flip-flopped or that she's incapable of standing for anything beyond her own ambitions, they are accused of throwing mud, victimizing a woman, and "swiftboating." Last night, she went back to the tried and true: the "yes/no" "answers" and the rote lines about being "comfortable in the kitchen." Senators Joe Biden and Chris Dodd---the most seasoned guys on the stage----just shake their heads in disbelief that they're losing to this hack. Nobody throws mud more pointedly and more efficiently than the Clinton Ladies Intervention Team. But they attack others for doing it (even when the others aren't) because it lets her get away with never having to answer anything. That's her scam. It's pathetic to see that she's still working it, and it's still working for her. Yesterday I posed a question about New York's Junior Senator. Now that New York Governor Eliot Spitzer---who had wanted to give driver's licenses to illegal immigrants despite overwhelming public opposition to it----withdrew his plan, Senator Clinton was left twisting in the wind. She fumbled the issue badly over the past two weeks, unable to give a clear position. When Spitzer backed away from it, what was the girl to do? Turns out the girl created a particular set of fortuitous circumstances. 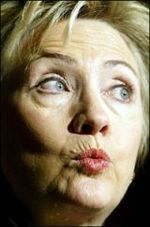 The Clinton Ladies Intervention Team got her out of this particular box by leaning---Tony Soprano-like---on Spitzer. They twisted his arm until he cried "uncle." They told him he had exactly 24 hours to disavow his OWN policy, or....well, he wouldn't want to know what was going to happen to him. Conveniently, today---the day before the Democratic debate----suddenly Spitzer has a change of heart about driver's licenses, paving the way for the Junior Senator to proclaim that now she herself is against the licenses. What a lucky break for the Gal from Chappaqua! Spitzer did as he was told. All of this would have been very convincing except for the bruises on Spitzer's forehead, which appear to have been applied by a hammer. The Clinton Ladies War Machine steamrolls anyone who gets in their way. It doesn't matter if you are a junior editor at GQ magazine or the Governor of New York. Out of Girlfriend's way, or sleep with the fishes.